Chicago, IL (January 2017) – Trees within a city can help reduce urban heat, control stormwater, and provide habitat to local wildlife. As climate conditions change, a Chicago group is working to enhance its urban forest so that the city can continue to receive these benefits. Chicago is home to around 10 million residents in neighborhoods that range from high-density urban settings to suburbs with yards and open space between single-family homes. Trees in yards and parks across the region provide some shade when temperatures rise, but the region’s tree canopy—the percentage of the ground covered by tree branches and leaves—is lower than in many other cities in the Midwest. The loss of 13 million ash trees to an invasive insect, the emerald ash borer, has further reduced the canopy in many areas. The cost of removing and replacing ash trees has exhausted many municipal budgets in the region, leaving little money to care for the remaining trees or time to plan ahead. The Chicago region is already experiencing temperature increases, more heavy rain events, and local flooding that can all place further stress on urban trees. These impacts are expected to become even more pronounced in the years to come. 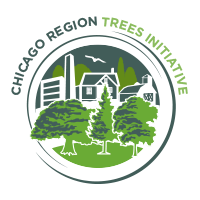 Faced with the decline of urban trees, concerned groups joined together to form the Chicago Region Trees Initiative. Their goals were to improve management skills and knowledge, increase the region’s tree canopy, and incorporate species that are resistant to pests and the impacts of climate change. Leslie Brandt, climate change specialist with the Northern Institute of Applied Climate Science and the U.S. Forest Service, partnered with the group to confront the decline in urban trees. Their goal was to assess the vulnerability of the region’s trees to climate change and other factors, and then move on to consider strategies for adaptation. The partners used habitat suitability modeling, projected changes in heat and hardiness zones, and an assessment of tree species’ adaptive capacity to assess the vulnerability of more than 150 tree species that are currently growing or recommended for planting in the region. The assessment showed that some of the least vulnerable trees in the region are non-native invasive species. Conversely, results indicated that many of the species native to the area are vulnerable to changing conditions. Representatives from counties, municipalities, and park districts worked with experts in climate change adaptation in a series of workshops on urban forest vulnerability and adaptation. Using a structured process, they evaluated which impacts and adaptive-capacity factors had the largest effects on vulnerability. Finally, they implemented a five-step adaptation project to incorporate climate change considerations into real-world projects and planning efforts, which included planting resilient trees. The Chicago Region Trees Initiative is integrating climate change-related goals into a regional tree master plan and updating its recommended planting list to encourage climate-adapted species. Communities across the Chicago region are working to incorporate vulnerability information and adaptation strategies in their work. Looking to the future, the initiative is seeking grant funding they will use to create real-world demonstrations of adaptation that resulted from the workshops.